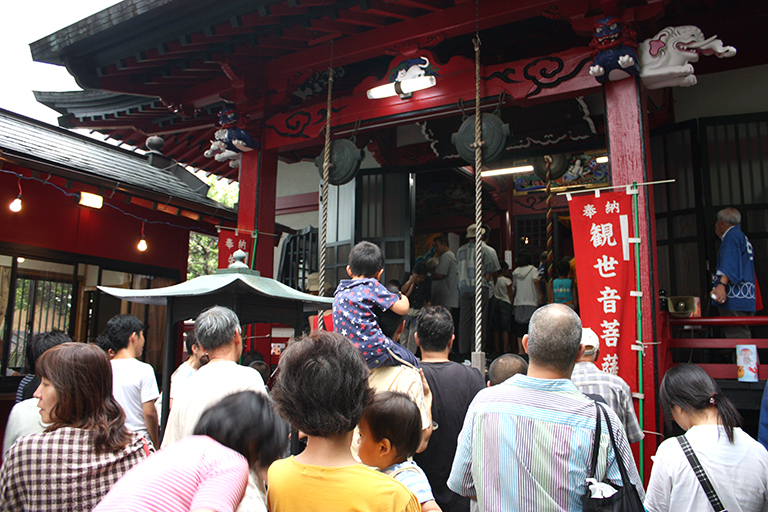 Women and men, both young and old, from around the area come to Emmei Temple to attend this festival. 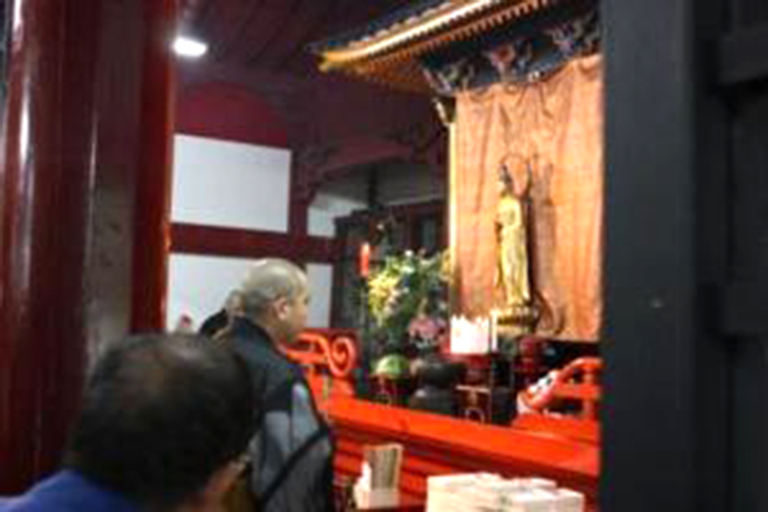 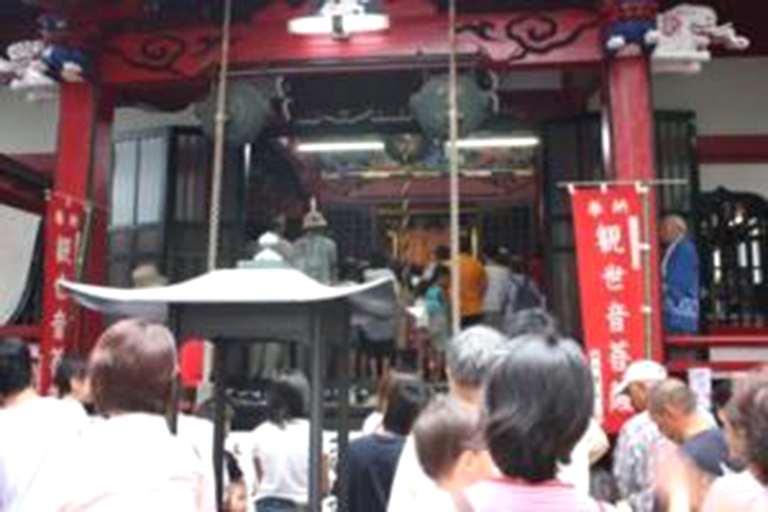 If you visit on this day, it is said that you will enjoy 48,000 days of merit and benevolence. 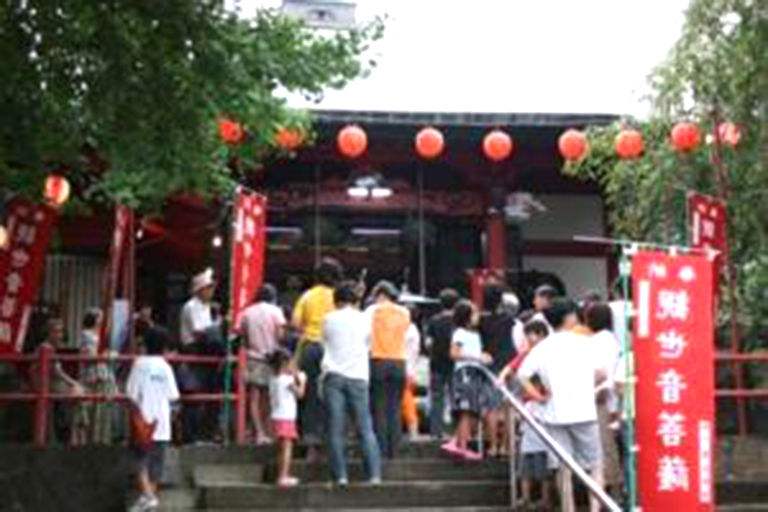 The temple grounds are filled with food stalls and people visiting this summer festival. 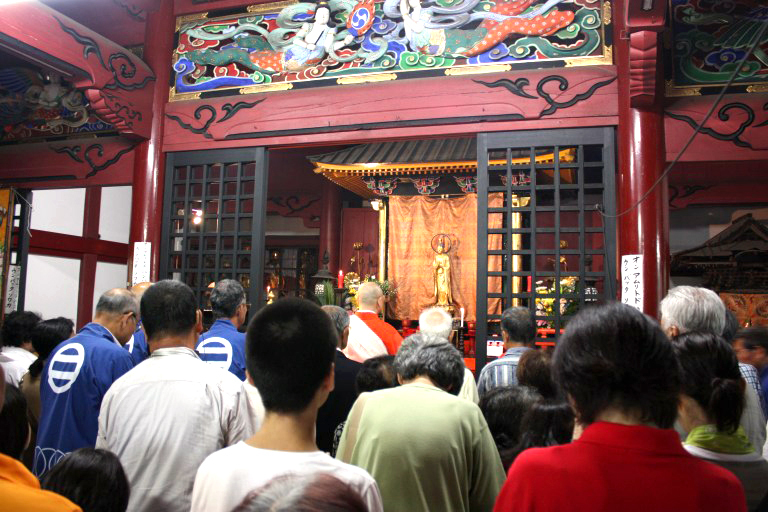 After visiting the shrine, why not stretch your legs for a bit by strolling along the cool river at dusk? 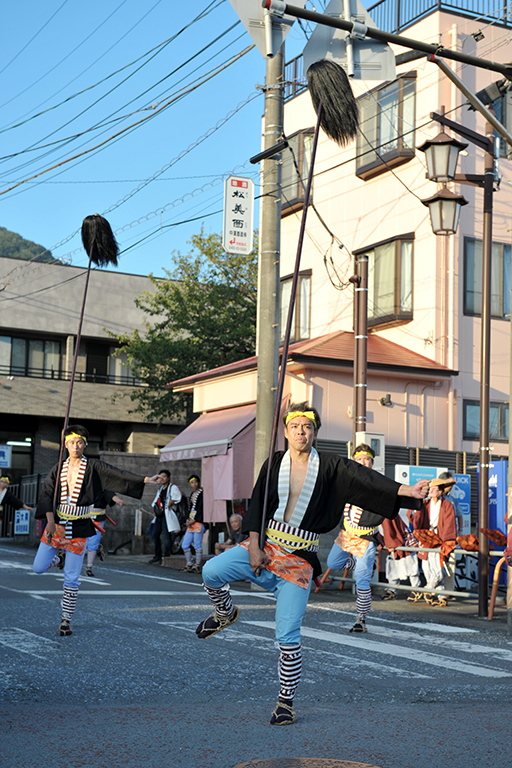 You might be met by a beautiful sunset while strolling along the road and the waterside. 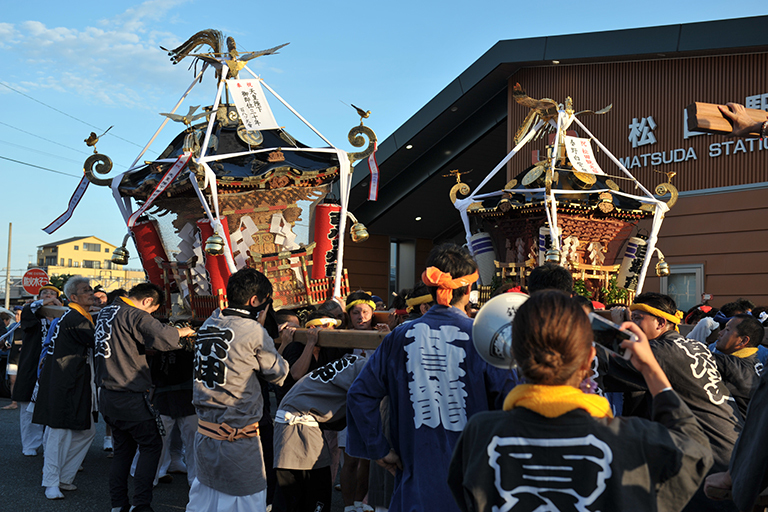 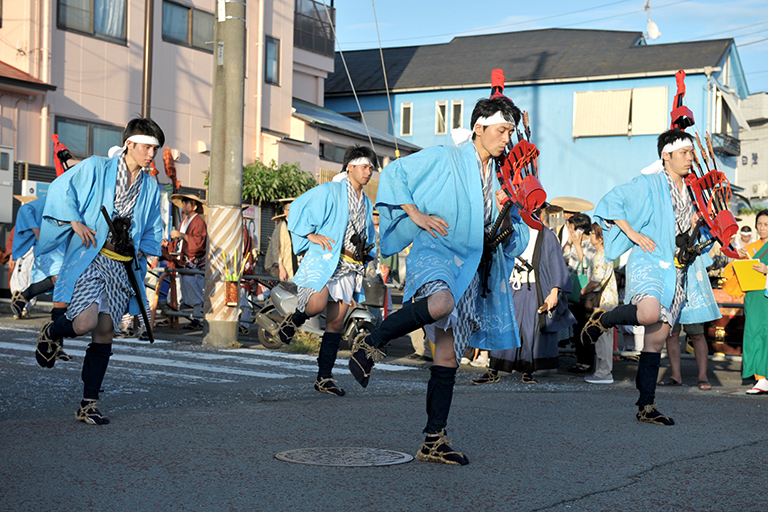 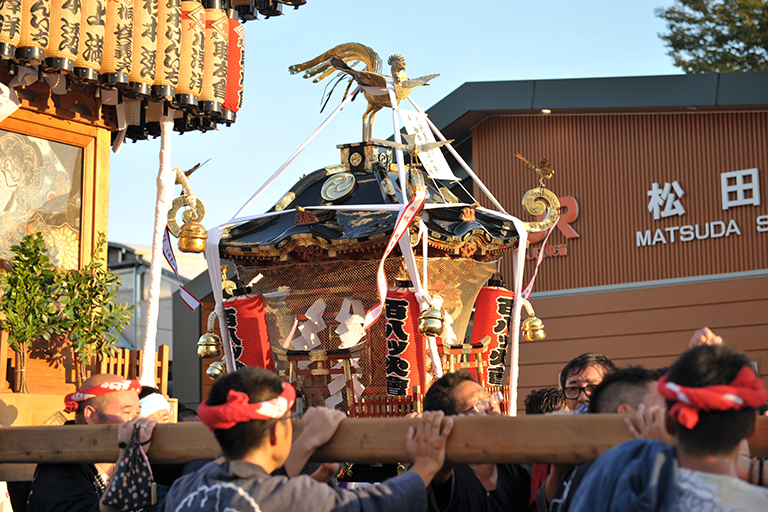 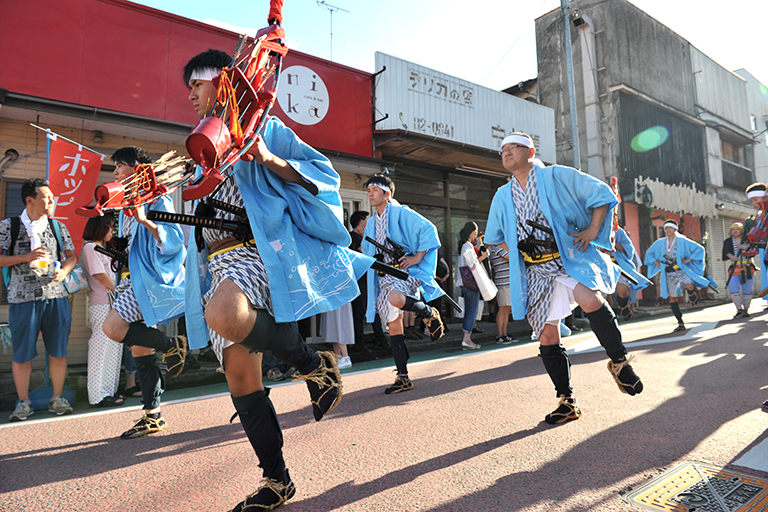 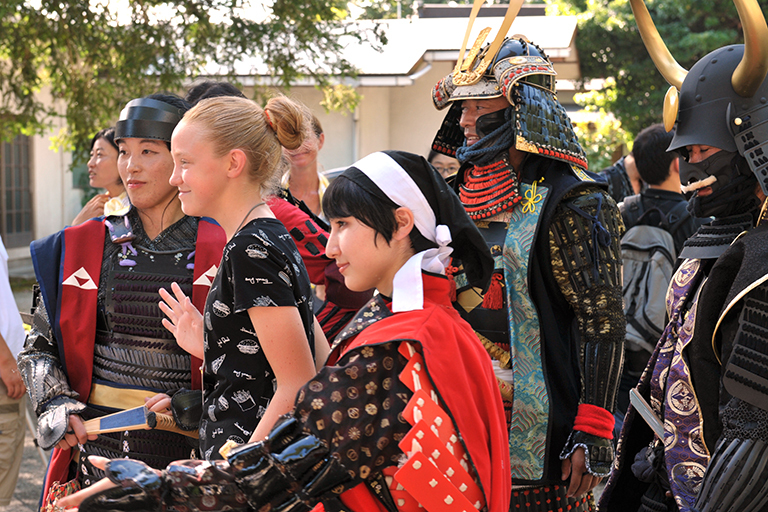 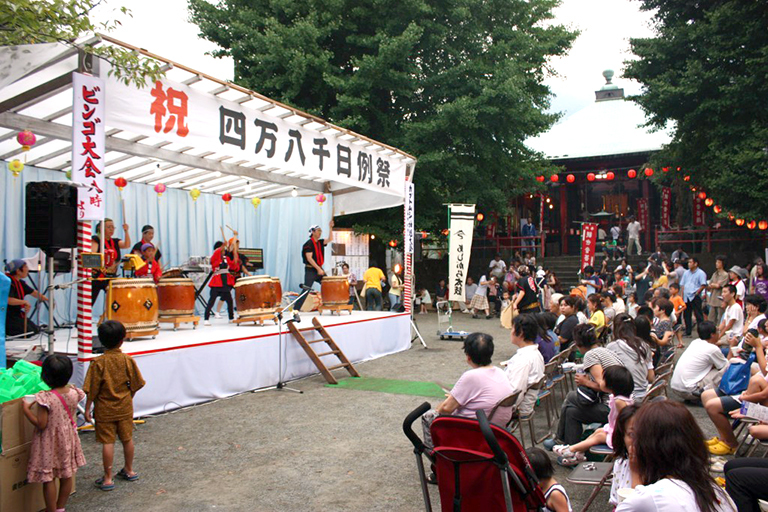 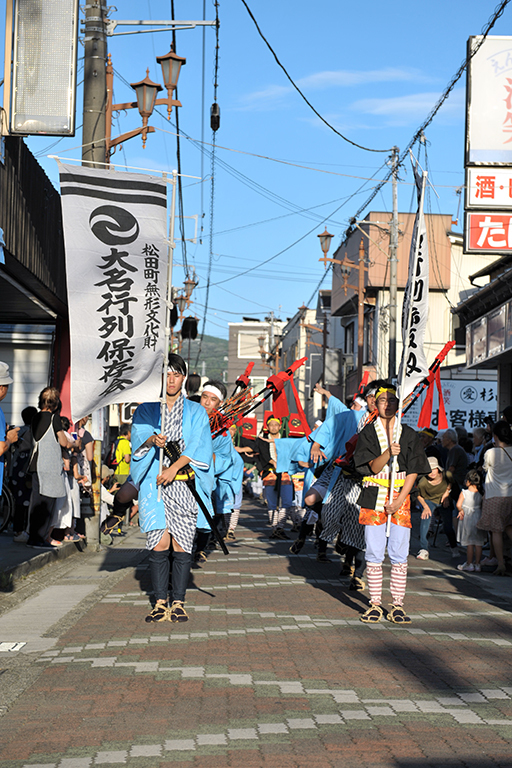 The Matsuda Tourism Festival has been a big event in Matsuda Town since 1973. 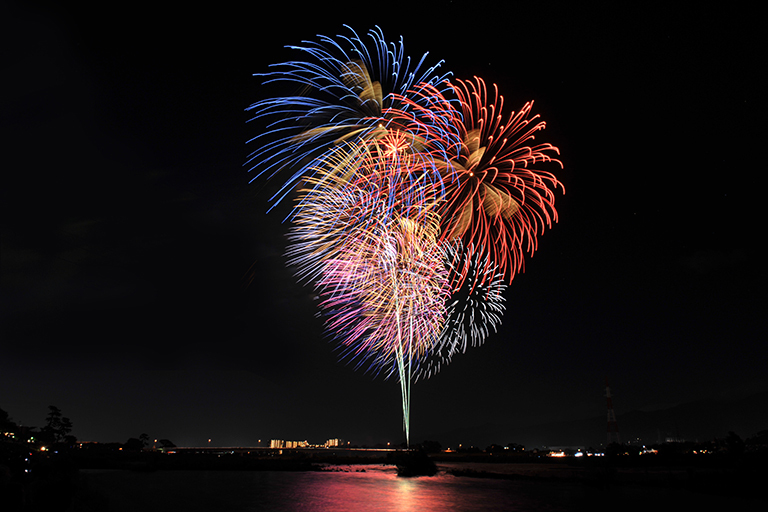 There are parades, fireworks, and much more. 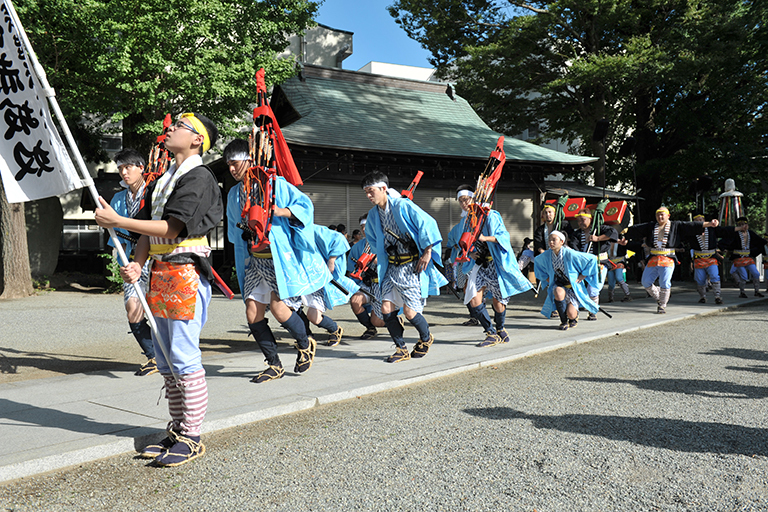 Among the main highlights are SAMURAI Parade and ‘hyakuhatte’ (lit: 108 fires). 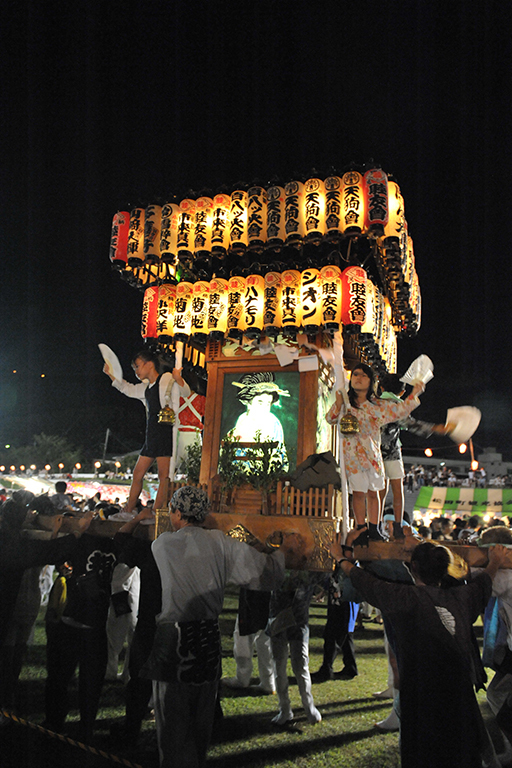 This festival gets bigger every year, and was recently selected as one of the top 50 festivals in Kanagawa Prefecture. 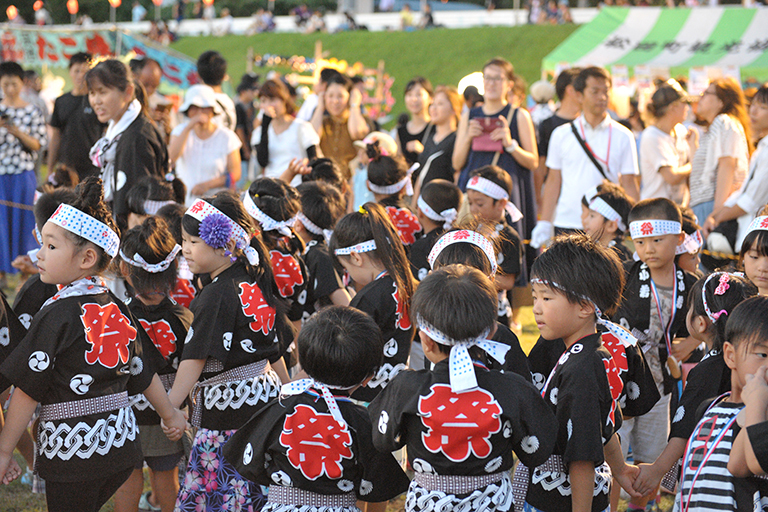 It is one of the biggest summer events in the area. 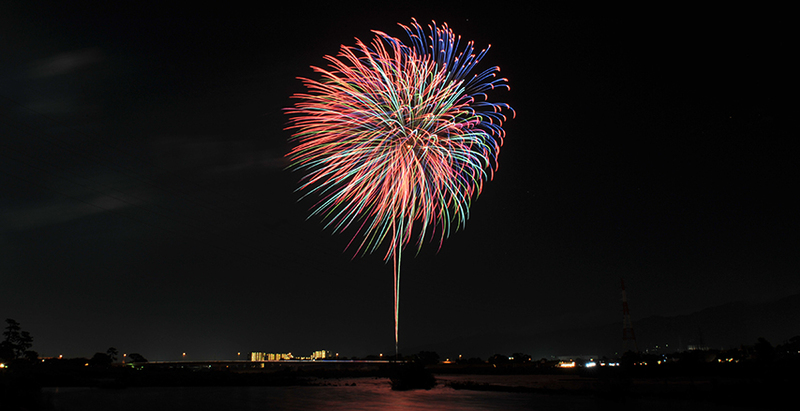 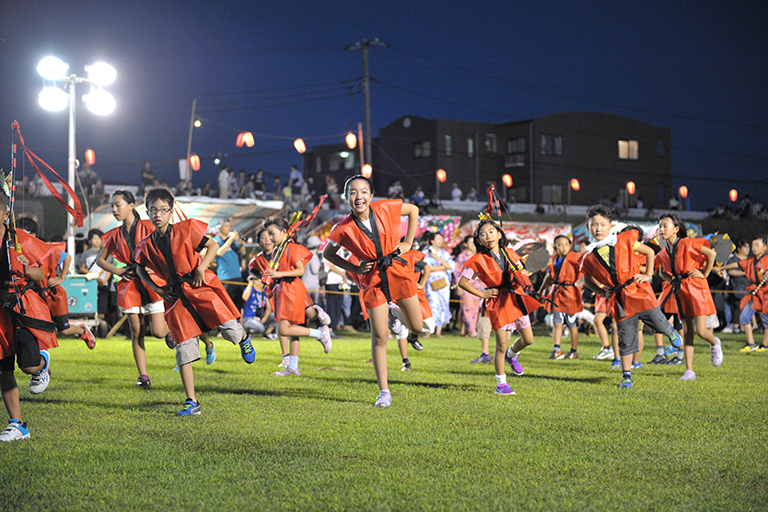 Since 2000 a shared firework festival is also held by Matsuda Town and Kaisei Town. 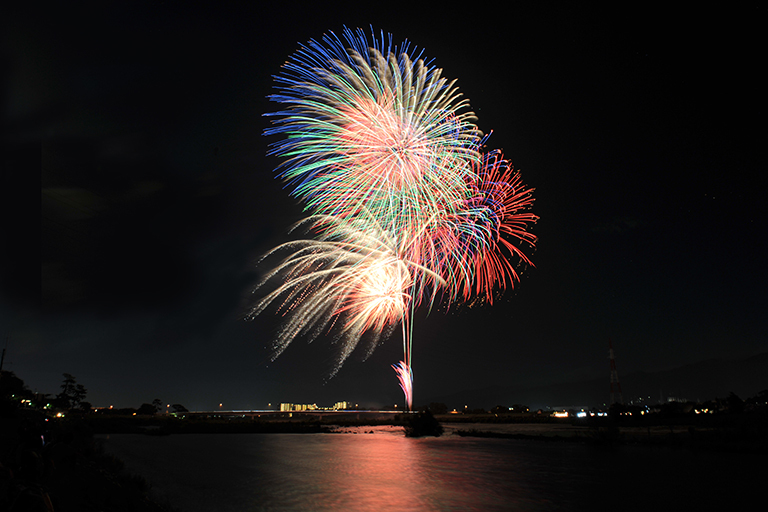 Enjoy the fireworks from the river terrace, lighting up the Ashigara night sky. 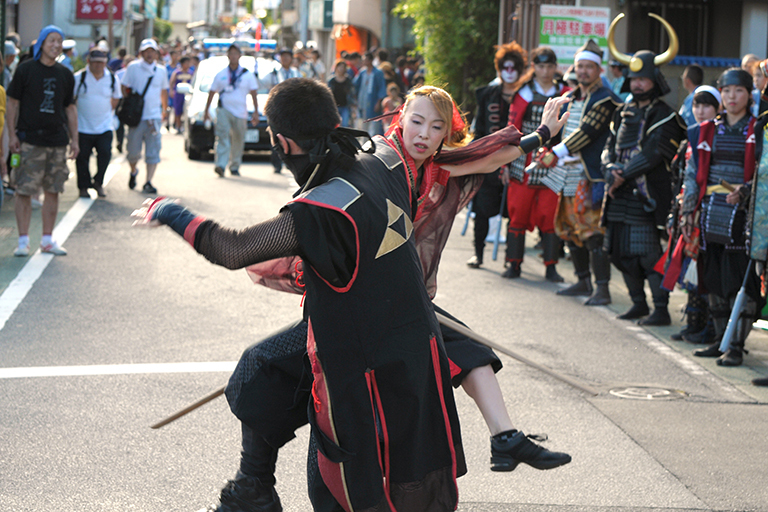 At Matsuda’s SAMURAI Parade a “Yakko-furi” performance will be shown. 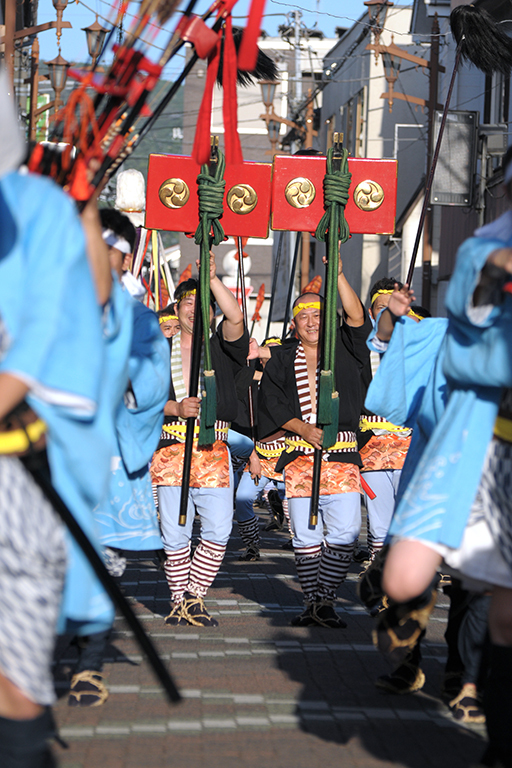 In 1871 the Meji government abolished the feudal system and established prefectures. 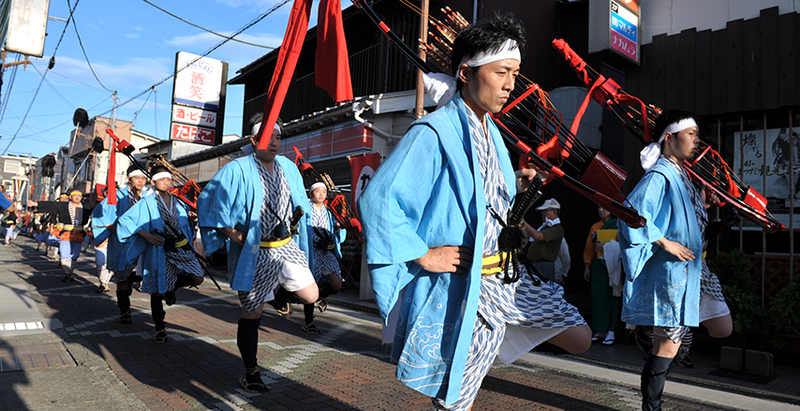 Feudal lords were now ‘kazoku’, a type of nobility. 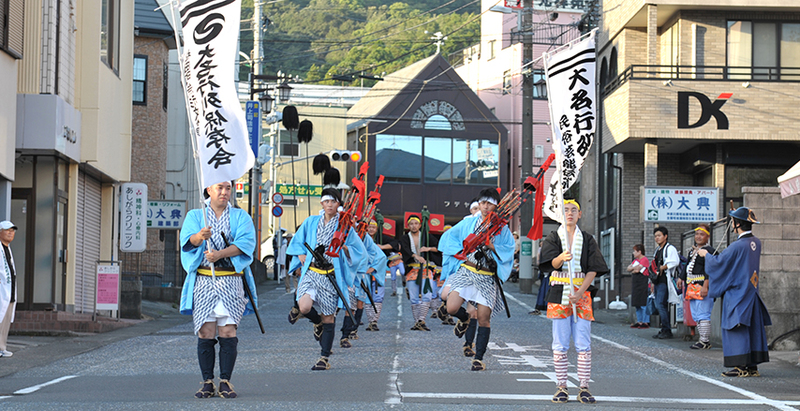 When the Odawara clan’s lord Okubo was transferred to Tokyo, the people of Matsuda asked him: “We want to protect the “Yakko-furi” parade of Samuta shrine. 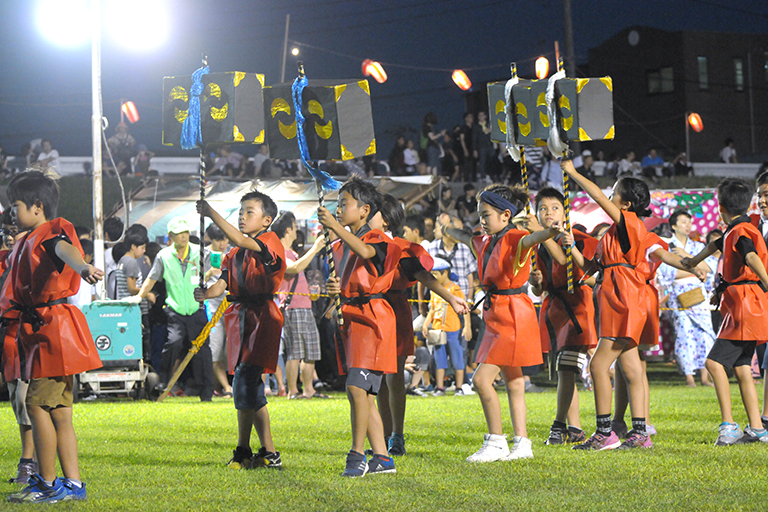 Please allow us to perform it for future generations”. 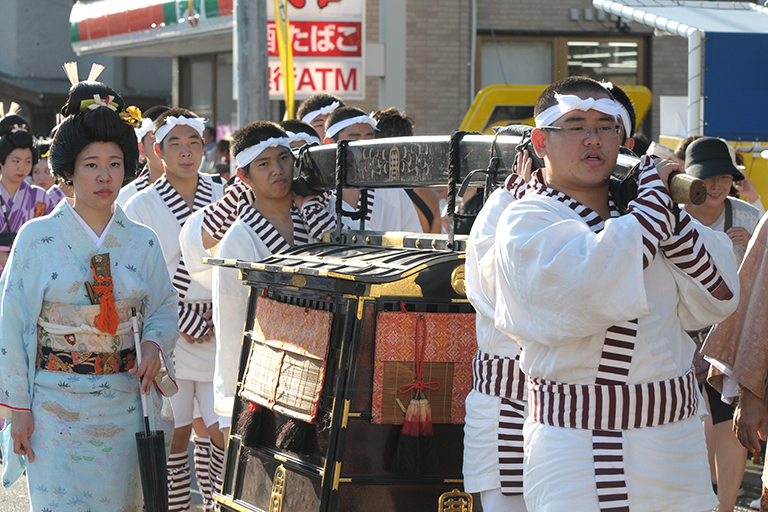 Okubo allowed it. 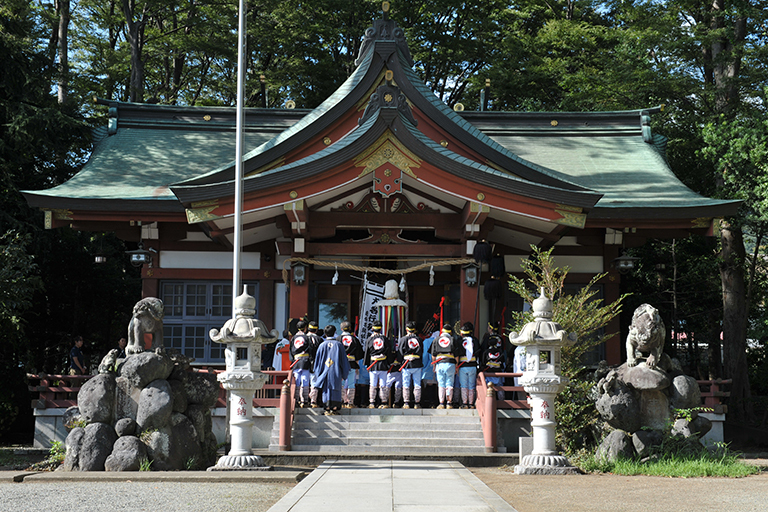 This is the first story of Yakko-furi in Matsuda. 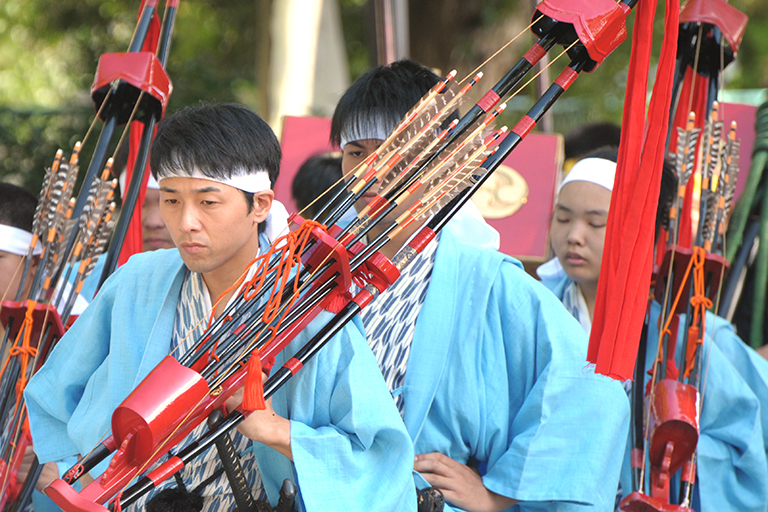 Since then there have been times when the Matsuda people could not perform Yakko-furi due to the deterioration of the tools. 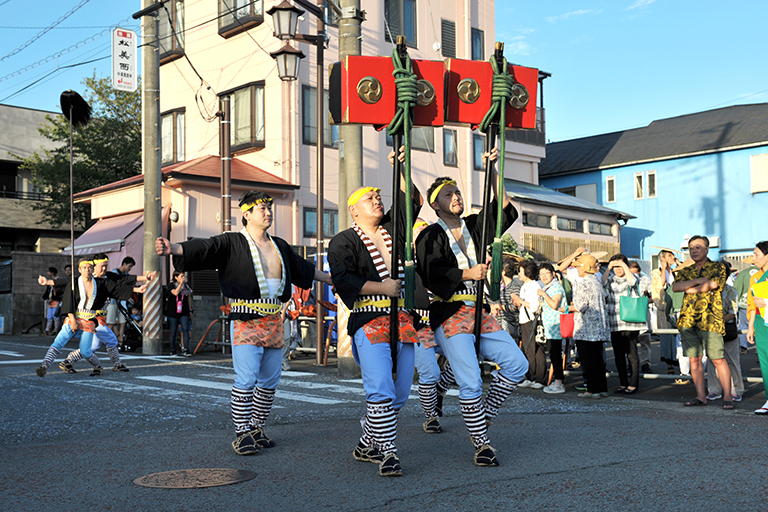 They replaced a cement barrel and a measurement bar, and it started gaining popularity. 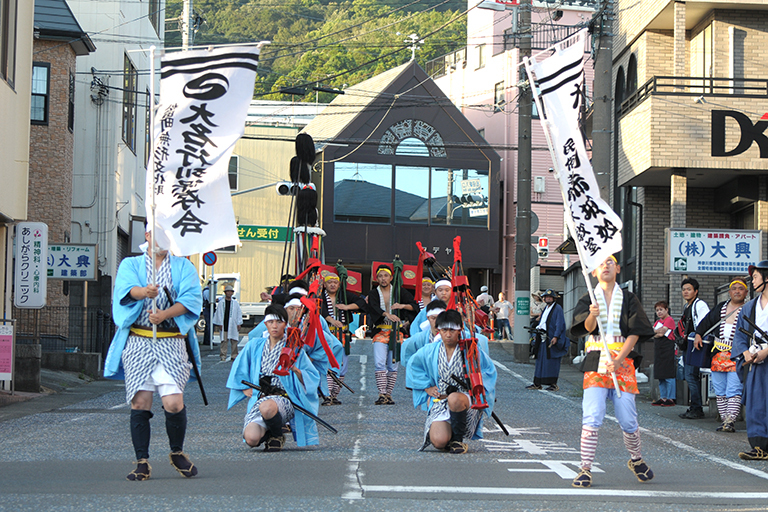 After the tools were renewed Yakko-furi became the official parade of Samuta shrine. 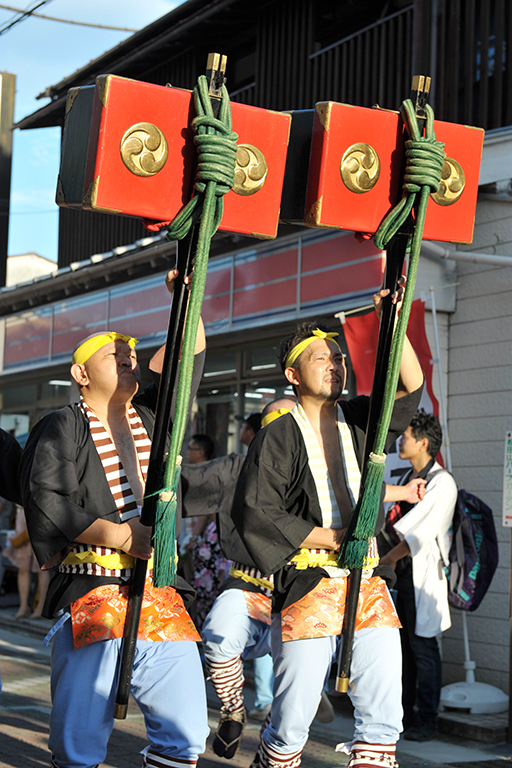 Matsuda’s Yakko-furi is active in various places throughout the country as it is now being shown at Tokyo, Yamagata, and Hokkaido. 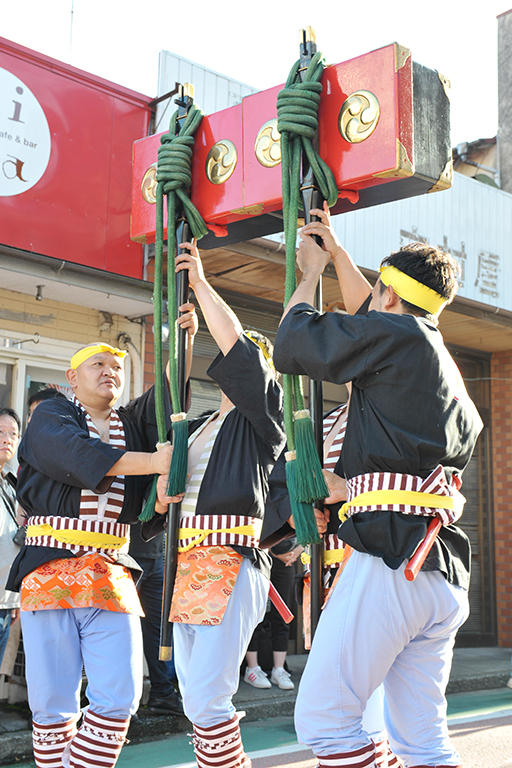 There are three shouts: “Hee-ha-hee”, “E-yat Makase” and “Yoi-yoiya-sassa”. 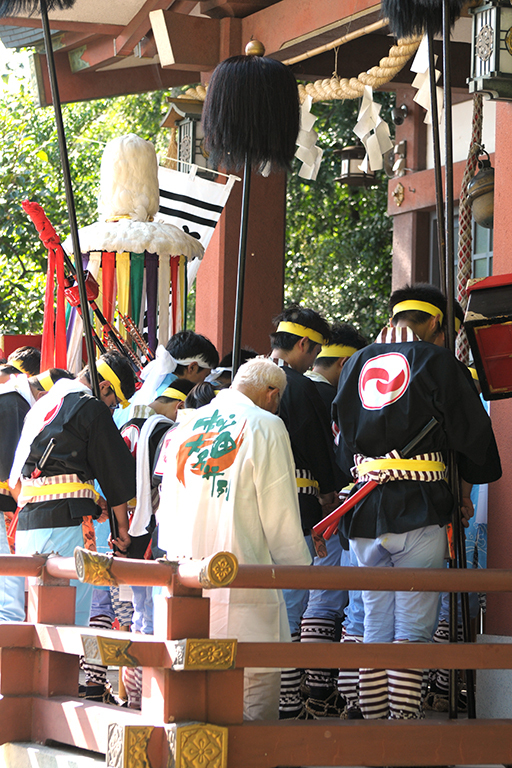 “Hee-ha-hee” means “down down”, which signals that the commoners need to put their heads down because the Daimyo has arrived. 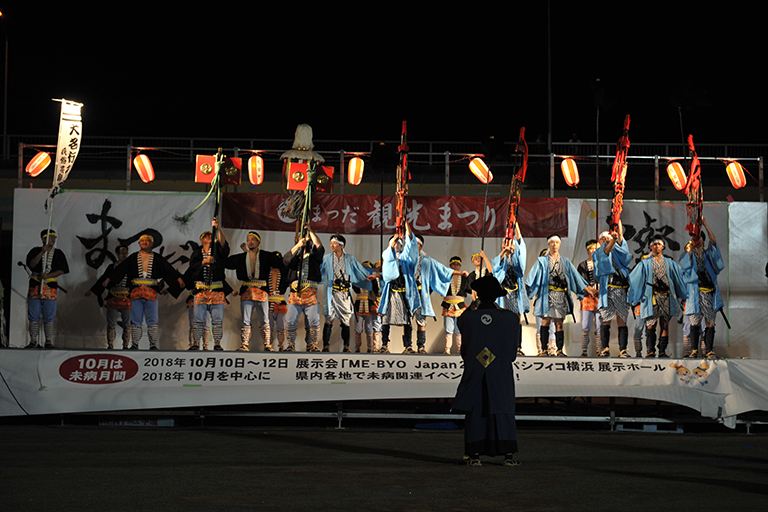 The meaning and the etymology are unknown about the last “Yoi-yoiya-sassa”. 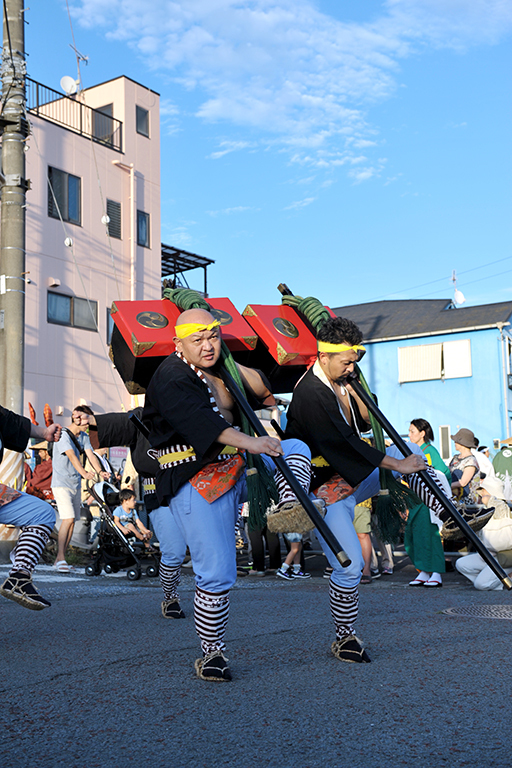 There are festivals that use similar shouts throughout the country, and it seems to be a word without particular meaning.